A very attractive old timey font on this salad. Not much else to brag about though. Oh, Trader Joe’s your salads are so uneven. Sometimes your salads are so good that I do little dances in my kitchen, and sometimes they simply fall flat. 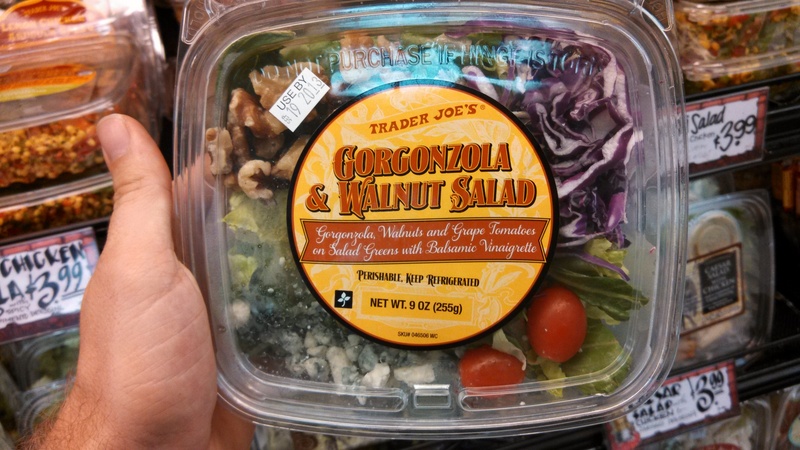 Trader Joe’s Gorgonzola and Walnut salad seemed like it was going to land in the first category, but ended up squarely in the second – rather bland and generally unexceptional. How do you go wrong with such a simple concept? 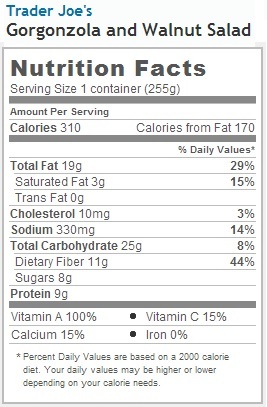 This salad has the fewest ingredients I’ve seen in basically any salad ever. They are, all inclusively, lettuce, cabbage, tomatoes, gorgonzola and walnuts. Five ingredients, that’s it. Such a pure, simple recipe, such a confident delivery – it’s enough to make you think those few ingredients are actually enough to make the salad taste good. It’s enough to make you think that gorgonzola and walnuts by themselves will be enough to make you sit up and go, “Yowza, I can’t believe this salad!” This, my friends, is not the case. Gorgonzola has been served alongside walnuts since time immemorial, for the very good reason that they pair well. You’d think these two would be a delicious meal in and of themselves, salad or not. Splash a little zingy balsamic vinaigrette on that, mix with some greens and you’d think we’d be talking about a definite winner. The fact that this salad actually tastes so plain and uninteresting is rather perplexing. The problem here lays in the cheese. When you think of a nice gorgonzola, you’re probably picturing something like a rich, aromatic wedge of veined bleu cheese. This istandard gorgonzola, the most popular kind, is known as gorgonzola piccante or gorgonzola naturale. It is this type of firm, crumbly, strong tasting gorgonzola that isn’t packaged in this salad. Instead, we are dealing with lumps of gorgonzola dolce, or “sweet” gorgonzola. This is your option B among gorgonzolas – a softer and much, much milder cheese. I’m quite boggled as to why TJ’s went for this mild variety. The stronger gorgonzola naturale would have melded deliciously with the nutty bitterness of the walnuts and the acidic pop of the balsamic dressing. Instead, the mild gorgonzola dolce fades into the unimpressive wallpaper of the lettuce and cabbage. The overall effect is that you’re left with a salad that never really seems to get started. Would I Recommend It: Not this one, no. Would I Buy It Again: There are too many delicious salads at TJ’s to waste time on this one. Final Synopsis: A perplexing cheese failure wrecks what could have been a great salad.